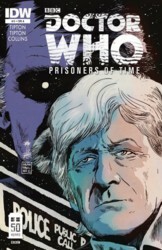 IDW's yearlong celebration of Doctor Who's 50th anniversary continues! "Now listen to me!" It's time to fire up Bessie, as the Third Doctor takes the spotlight in this issue of a 12-part epic adventure featuring all 11 incarnations of the Doctor!